clinical aspects of the program each student has an assigned Basic Science Mentor as well as a Clinical Mentor. These two mentors guide students in their choice of didactic courses, clinical seminars and clinician interactions. Basic Science Mentors: All participating graduate students have already identified their thesis mentor when they matriculate in the program. The thesis adviser also serves as the Basic Science Mentor for the VPMM. Similarly, the research mentor for postdoctoral trainees also serves as the Basic Science Mentor for the VPMM. All full-time basic science tenured and tenure-track faculty members at VUMC are eligible to serve as Basic Science Mentors. Clinical Mentors: The selection of the Clinical Mentor for each incoming participant is paramount for the success of this program component. The trainee, in consultation with his/her Basic Science Mentor suggests three Clinical Mentors for consideration at the time of application to the VPMM. The Advisory Committee reviews this list and assigns a Clinical Mentor for successful applicants. The clinical mentor is encouraged to participate in thesis or advisory committee meetings during the course of the program, but is not required to be a standing member. Clinical Conferences: At VUMC, a wide array of clinical conferences are available to VPMM participants. These include weekly departmental Grand Rounds, subspecialty divisional rounds, clinical case conferences, clinical departmental research conferences, tumor boards, and special invited lectures on global health, biomedical ethics, and medical education. The clinical mentor assists the student/postdoc to select those presentations with the greatest impact given the interest and clinical focus for the trainee. Physician/Patient Observations: The Clinical Mentor is essential to facilitate the ability of the trainee to directly interact with patients. 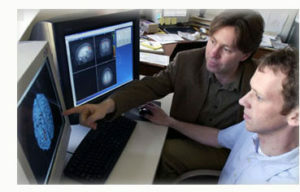 Opportunities for physician patient observation include attending ward educational rounds where new and interesting patients in the area of clinical application are discussed, participating in ambulatory subspecialty clinics to appreciate the common issues requiring intervention, participating in examination of patient materials such as surgical pathology specimens, bone marrow aspirates or peripheral blood smears, neurological or other functional imaging, or postmortem analysis. Introduction to Clinical and Translational Research: This is a spring semester IGP module that has been designed to provide a broad introduction to the principals and challenges of human subjects research today. Topics covered include clinical trials, drug development and regulation, bio-repositories and EMR, IRB and ethical considerations, and translational research support and opportunities at Vanderbilt. VPMM Clinical Rounds: This course is held in the fall semester. It focuses on a greater range of clinical topics reflecting the diverse interests of the VPMM. We will cover a different topic every two weeks. One week will be run by a clinician and will meet 1 or 2 patients with the disorder under discussion. The other week will be run by a basic and/or clinical scientist working on the same disease, and will involve interactive discussion about the patient’s disease pathophysiology, treatments and research. Program Orientation: All new trainees and their mentors (if possible) attend three weekly orientation meetings in September. These meetings are held to insure that all new members in the program understand all the component parts and their role over the next 2-3 years. Seminar Series: The seminar series meeting is a forum for all participants to discuss progress in the program or to bring up any issues that may have arisen. This is followed either by a research presentation by a trainee, or by an invited speaker. These are typically held on the third Wednesday of the month from 5:00 pm – 6:15 pm in Light Hall 350. Bench-to-Bedside Symposium: The Vanderbilt Program in Molecular Medicine has developed the “Bench to Bedside” mini-symposium series as a forum to enhance interaction and discussion between the various Vanderbilt graduate and post-doctoral education programs that are promoting clinical enrichment for basic scientists. The format and topics vary at each meeting but in principal focus around a clinical and basic science topic in the context of a particular disease. These are typically held on the first Wednesday of the month from 5:30 pm – 7:30 pm in 1220 Medical Research Building III. The Vanderbilt Program in Molecular Medicine is structured to be completed in 3 years by graduate students, and we expect no delay in time to Ph.D. degree for participants in this program. We expect postdoctoral trainees to complete all program requirements in 2 years.